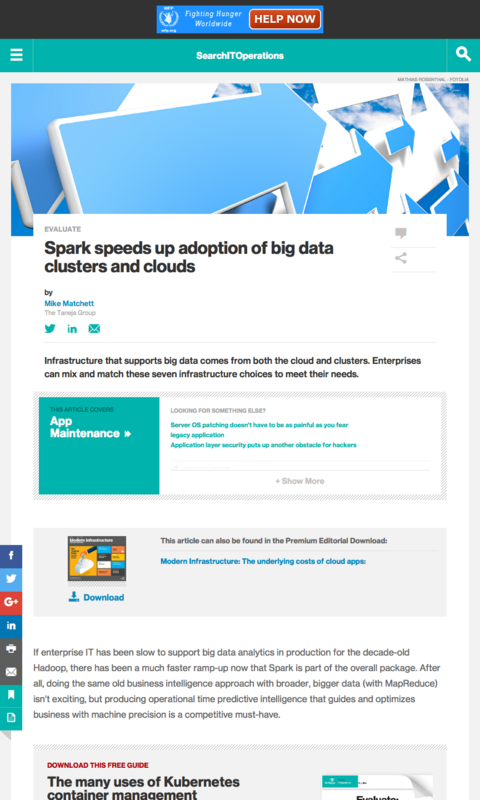 If enterprise IT has been slow to support big data analytics in production for the decade-old Hadoop, there has been a much faster ramp-up now that Spark is part of the overall package. After all, doing the same old business intelligence approach with broader, bigger data (with MapReduce) isn’t exciting, but producing operational time predictive intelligence that guides and optimizes business with machine precision is a competitive must-have. With traditional business intelligence (BI), an analyst studies a lot of data and makes some hypotheses and a conclusion to form a recommendation. 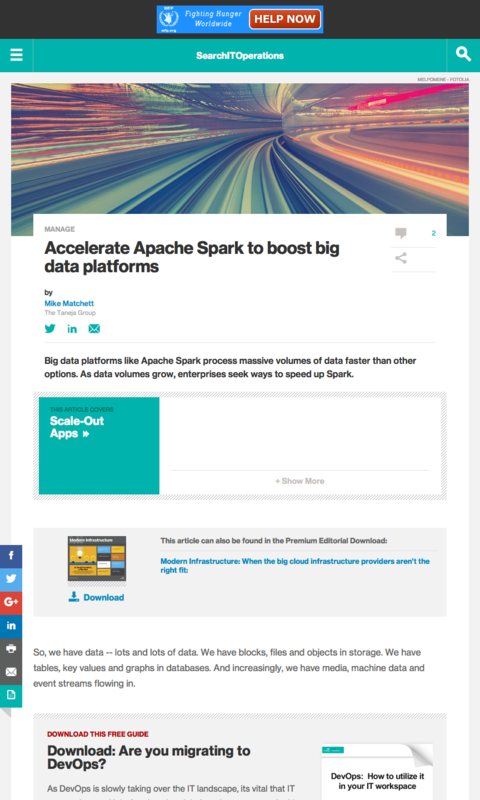 Using the many big data machine learning techniques supported by Spark’s MLlib, a company’s big data can dynamically drive operational-speed optimizations. Massive in-memory machine learning algorithms enable businesses to immediately recognize and act on inherent patterns in even big streaming data. 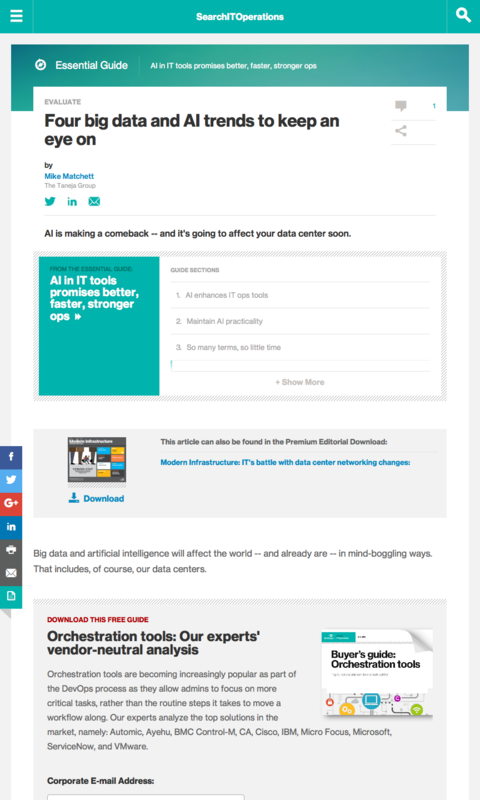 But the commoditization of machine learning itself isn’t the only new driver here. A decade ago, IT needed to stand up either a “baby” high performance computing cluster for serious machine learning or learn to write low-level distributed parallel algorithms to run on the commodity-based Hadoop MapReduce platform. Either option required both data science and exceptionally talented IT admins that could stand up and support massive physical scale-out clusters in production. Today there are many infrastructure options for big data clusters that can help IT deploy and support big data-driven applications. So, we have data — lots and lots of data. We have blocks, files and objects in storage. We have tables, key values and graphs in databases. And increasingly, we have media, machine data and event streams flowing in. It must be a fun time to be an enterprise data architect, figuring out how to best take advantage of all this potential intelligence — without missing or dropping a single byte. 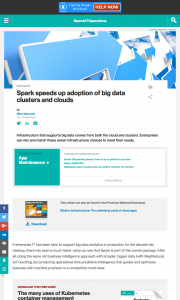 Big data platforms such as Spark help process this data quickly and converge traditional transactional data center applications with advanced analytics. If you haven’t yet seen Spark show up in the production side of your data center, you will soon. Organizations that don’t, or can’t, adopt big data platforms to add intelligence to their daily business processes are soon going to find themselves way behind their competition. Spark, with its distributed in-memory processing architecture — and native libraries providing both expert machine learning and SQL-like data structures — was expressly designed for performance with large data sets. 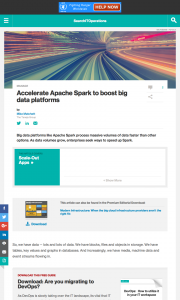 Even with such a fast start, competition and larger data volumes have made Spark performance acceleration a sizzling hot topic. You can see this trend at big data shows, such as the recent, sold-out Spark Summit in Boston, where it seemed every vendor was touting some way to accelerate Spark. In-memory improvements. Spark can use a distributed pool of memory-heavy nodes. Still, there is always room to improve how memory management works — such as sharding and caching — how much memory can be stuffed into each node and how far clusters can effectively scale out. Recent versions of Spark use native Tungsten off-heap memory management — i.e., compact data encoding — and the optimizing Catalyst query planner to greatly reduce both execution time and memory demand. According to Databricks, the leading Spark sponsor, we’ll continue to see future releases aggressively pursue greater Spark acceleration. Native streaming data. 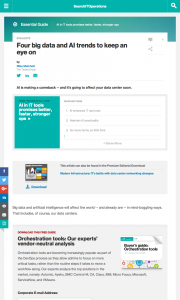 The hottest topic in big data is how to deal with streaming data. Clusters are the scale-out way to go in today’s data center. Why not try to architect an infrastructure that can grow linearly in capacity and/or performance? Well, one problem is that operations can get quite complex especially when you start mixing workloads and tenants on the same cluster. In vanilla big data solutions everyone can compete, and not always fairly, for the same resources. This is a growing problem in production environments where big data apps are starting to underpin key business-impacting processes.